2 Welcome to the first step in being elected! 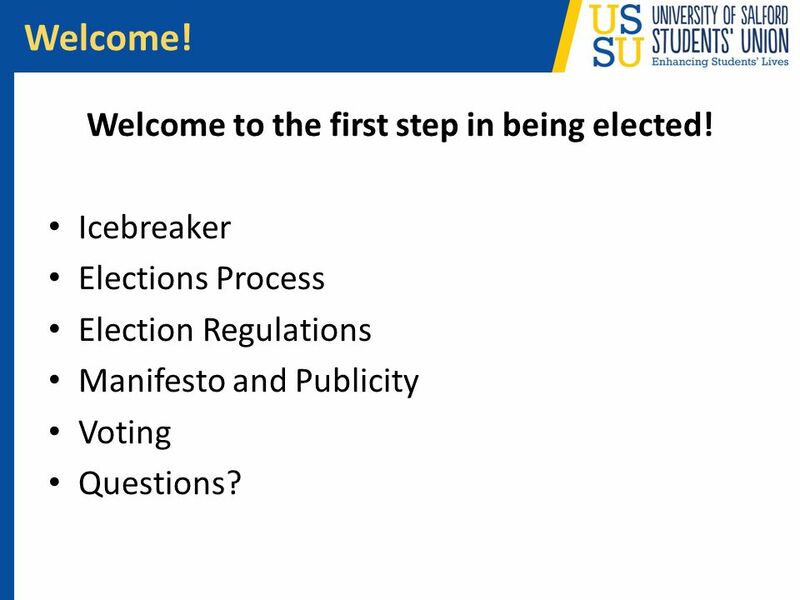 Icebreaker Elections Process Election Regulations Manifesto and Publicity Voting Questions? 4 Congratulations – you are now officially a candidate! 5 Congratulations – you are now officially a candidate! 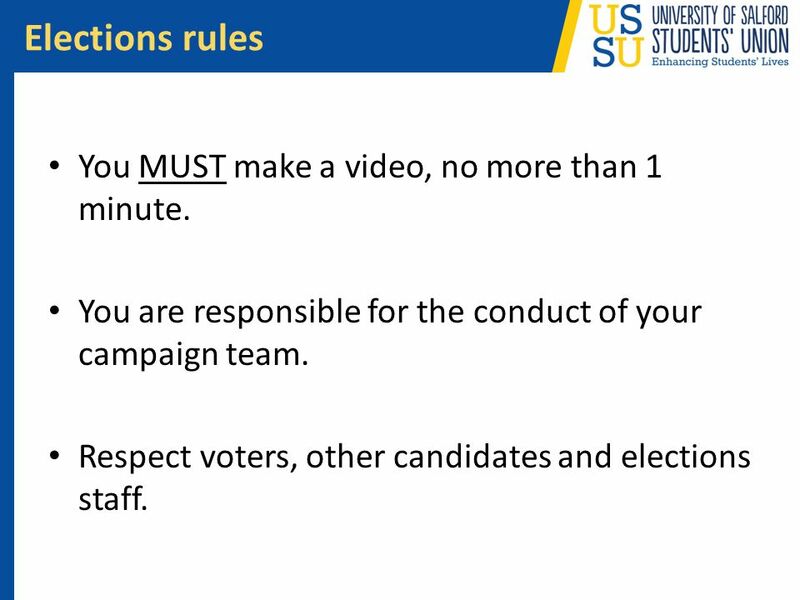 8 Elections rules You MUST make a video, no more than 1 minute. 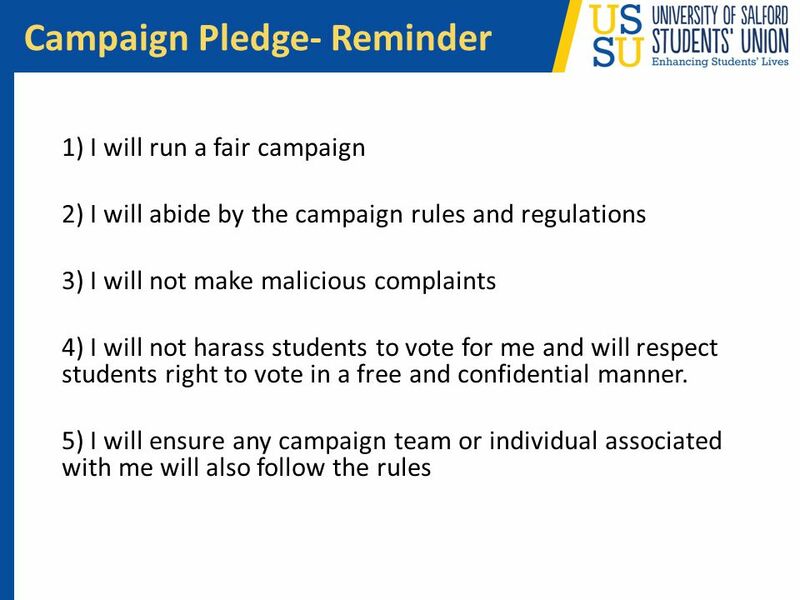 You are responsible for the conduct of your campaign team. Respect voters, other candidates and elections staff. 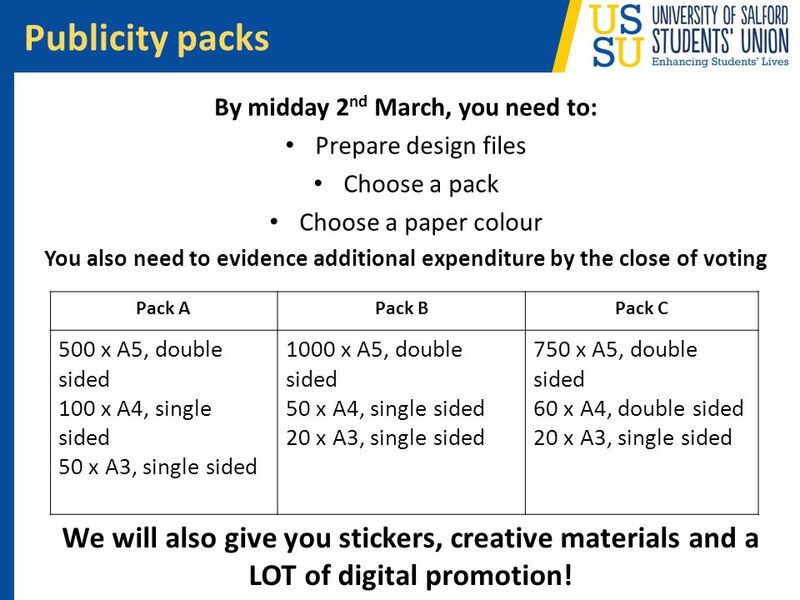 Publicity packs By midday 2nd March, you need to: Prepare design files Choose a pack Choose a paper colour You also need to evidence additional expenditure by the close of voting Pack A Pack B Pack C 500 x A5, double sided 100 x A4, single sided 50 x A3, single sided 1000 x A5, double sided 50 x A4, single sided 20 x A3, single sided 750 x A5, double sided 60 x A4, double sided We will also give you stickers, creative materials and a LOT of digital promotion! 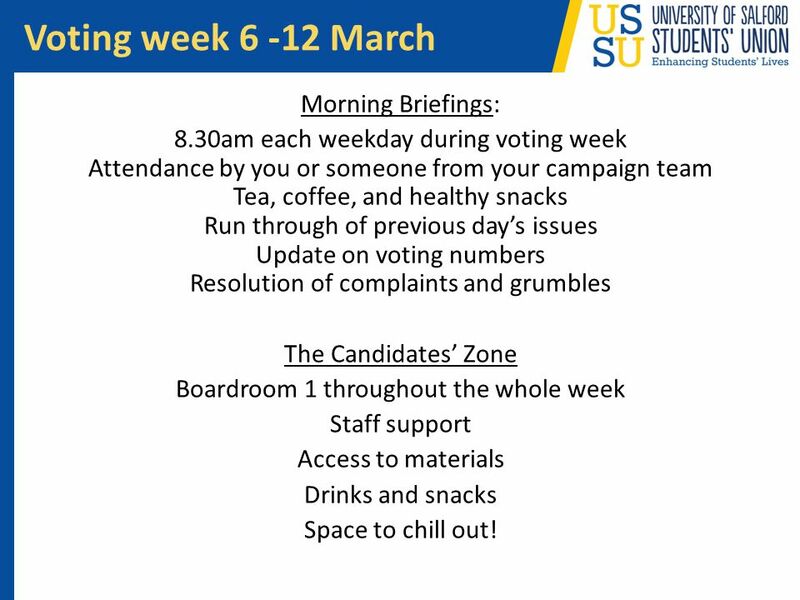 13 Voting week March Morning Briefings: 8.30am each weekday during voting week Attendance by you or someone from your campaign team Tea, coffee, and healthy snacks Run through of previous day’s issues Update on voting numbers Resolution of complaints and grumbles The Candidates’ Zone Boardroom 1 throughout the whole week Staff support Access to materials Drinks and snacks Space to chill out! 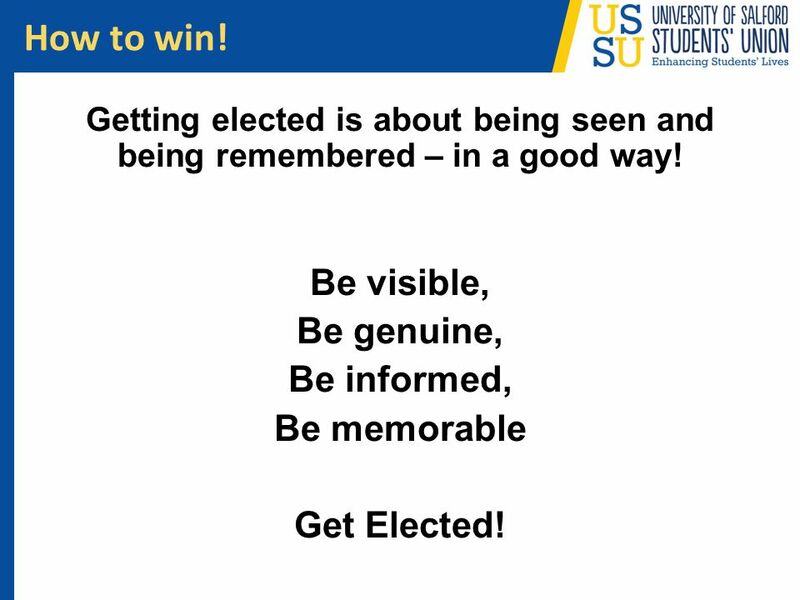 Getting elected is about being seen and being remembered – in a good way! Be visible, Be genuine, Be informed, Be memorable Get Elected! 15 Let’s go! Any questions? 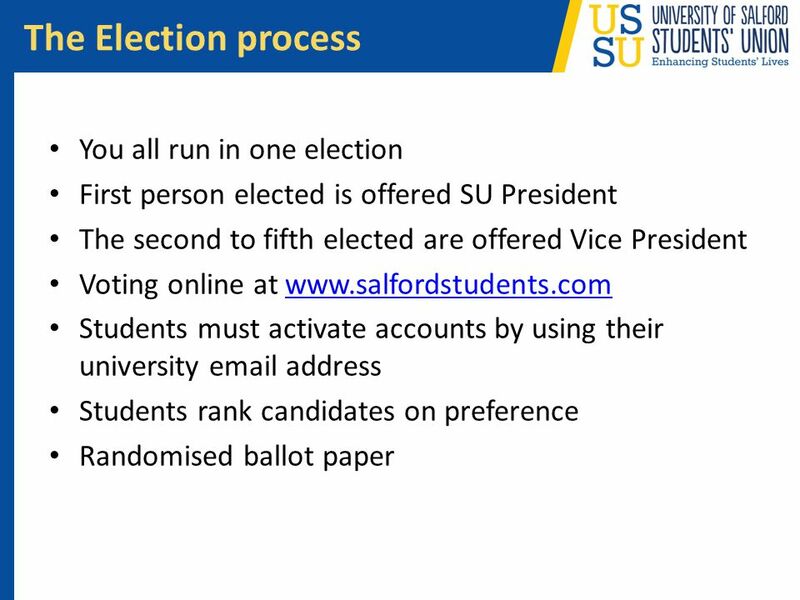 Download ppt "Welcome to the Students’ Union elections! Candidates’ Briefing 2015"
MAIN COMMITTEE OFFICERS DUTIES AND RESPONSIBILITIES. 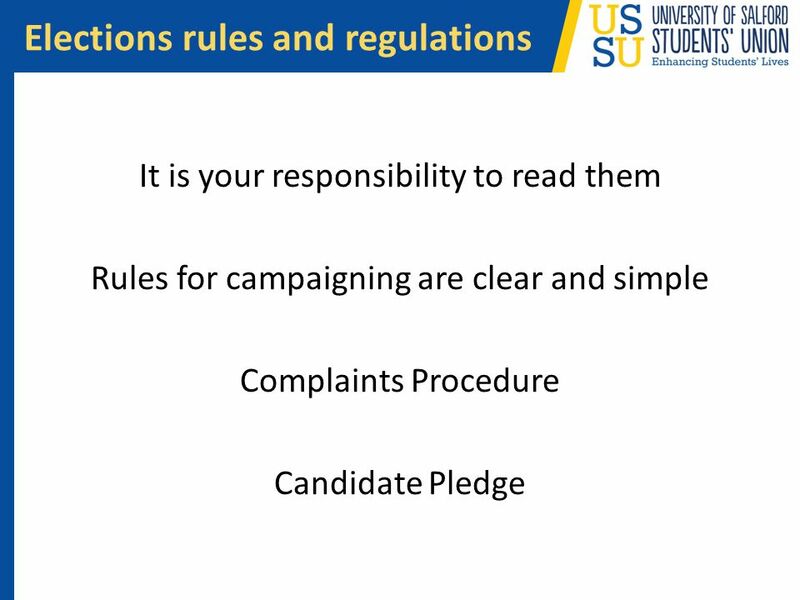 INTRODUCTION TO CAMPAIGNING. SESSION AIMS Welcome! 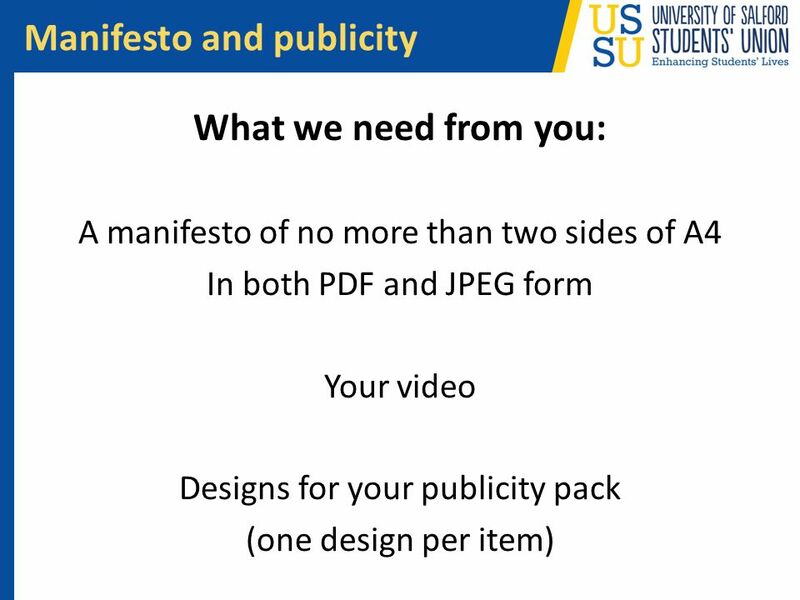 We aim to ensure you leave this session with the following knowledge: You know what a campaign is You. 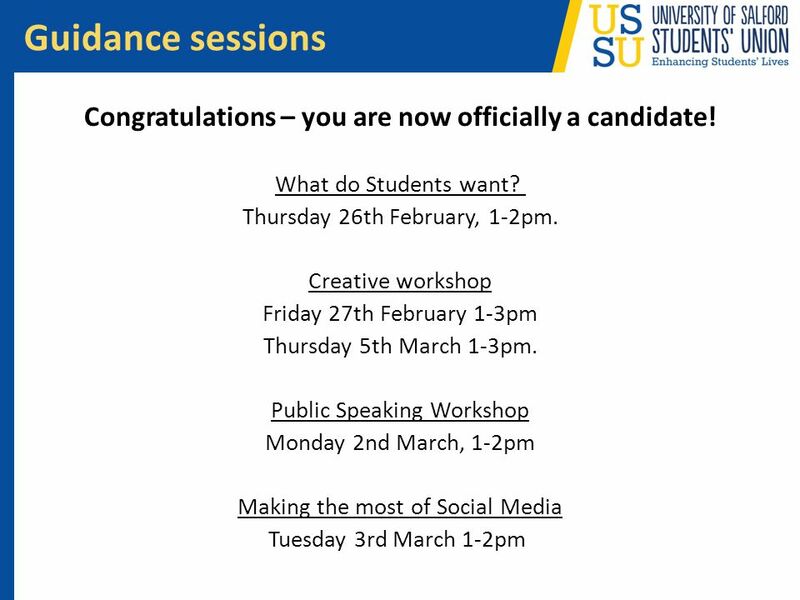 Bringing your club and society elections to life Fiona Ellison & Rosie Hunnam NUS Student Opportunities team. Wayne Martin National Student President Alpha Beta Gamma THE ROLE OF NATIONAL STUDENT OFFICERS. 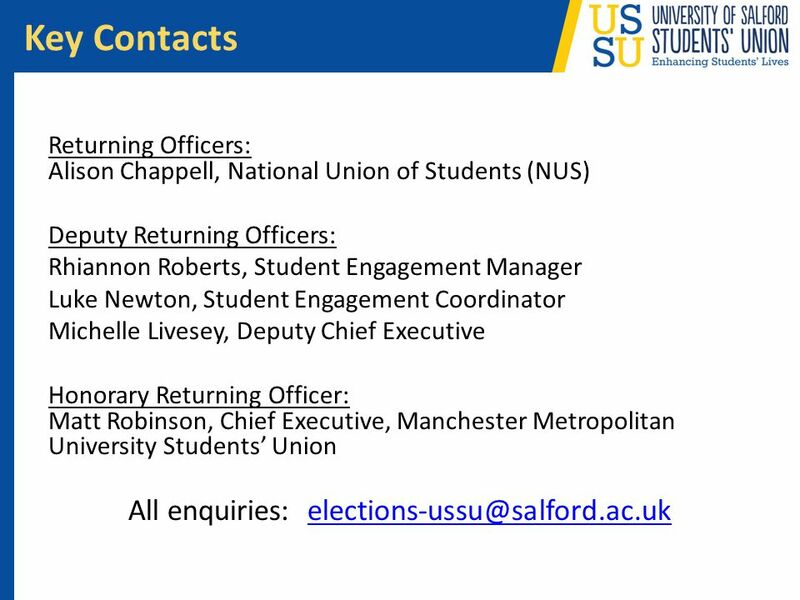 ; Students’ Union Elections 2013 If you have picked up this pack, it means you are considering becoming a Student Union Representative for all your fellow. Campaign and Manifesto training SLIDE TITLE Objectives By the end of today’s session, you will be able to: Describe what students at Queen Mary have in. Daniel Curran & Emma Peagam. 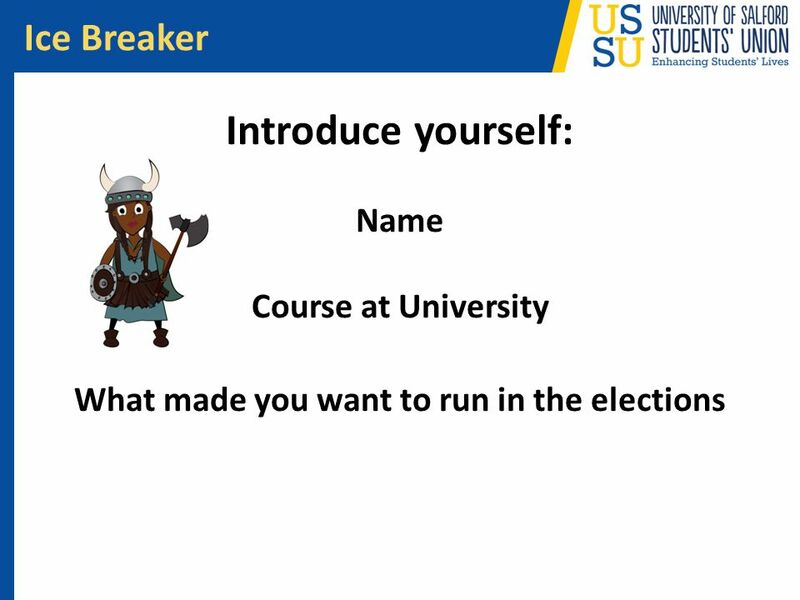 Ice Breaker The SU Your role Structure Who you will work with Communication Reporting problems Chairing meetings Scenarios. DRAFT Hollis & Hollis Brookline Cooperative School Districts SB2 Public Hearing February 22, AHM Rev B 2/10/12. 1 PA / PTA Election Guide Chancellor’s Regulation A-660. 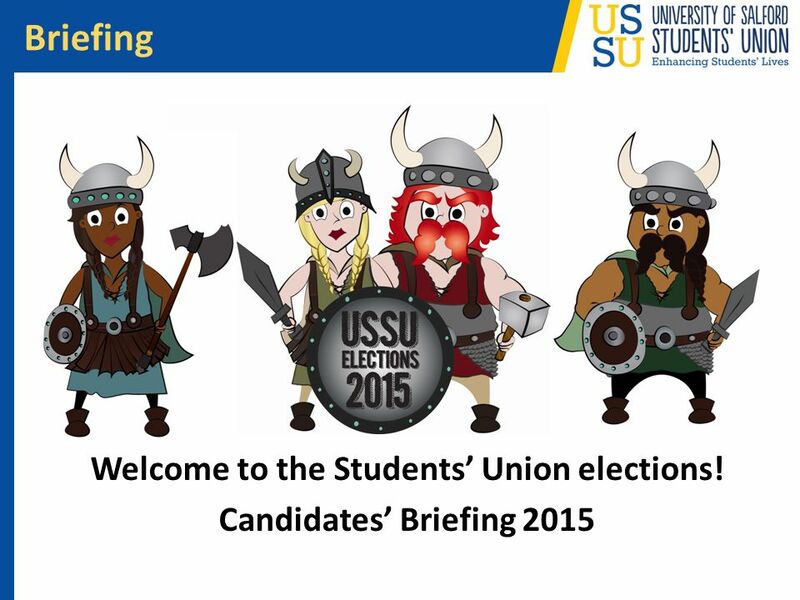 Loughborough Students’ Union Candidates Pack Union Affairs Committee. Who’s in the room? Are you a School Representative? If not - are you a Chairperson? If neither, what is your role? Who attended the introductory training.  SGA Election Interest Meeting January 23, :00 p.m. Shiloh Room. Elections 2015 Candidate Briefing Roger Weston Membership Services Manager. ELECTIONS Welcome! Video WHY ARE YOU HERE? 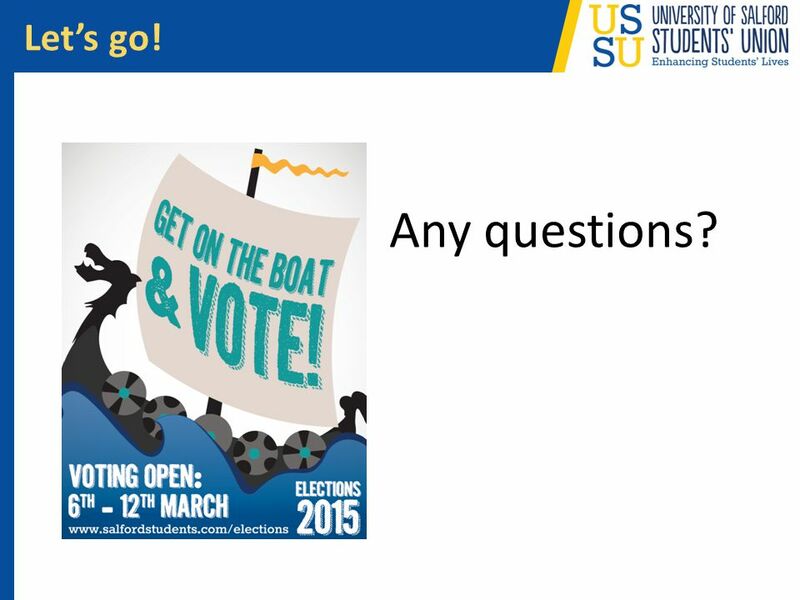 Introduction People Themes of the election Campaigning Currently at UEL… Manifestos The Rules General. Agenda Election Processes Regulations Expenses How Voting Works Campaign Advice Timeline Questions. Mike Luna Director of Student Activities Otis College of Art and Design. Student Rep Co-ordinator Briefing Friday the 13 th of September. At Woodley we believe that every child deserves the best possible start in life and the support that enables them to fulfil their potential. We value the.